Ever wonder what it was like to drink water before plastics came along? Or even before it was mixed with the taste of its metal container? With purifyou's new premium glass water bottle, made from the finest products on earth, you drink from your water bottle with no metal taste or plastic chemicals leaching into your water. 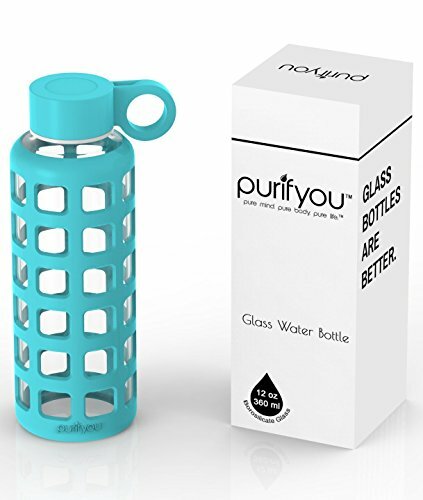 Our glass water bottle is perfected for the environment AND the end user. The water bottle is 100% leak-proof, and 100% kid proof too. Its easy twist-off cap ensures quick access to your own personal oasis. Plus, the glass water bottle features a wide mouth opening that fits ice and fruit, but is also narrow enough to drink without drenching your new shirt. Our high impact-resistant silicone sleeve also protects your glass water bottle better than any other. The silicone sleeve's non-slip grip and the cap's large O-ring also enable the multi-tasker in you to carry more than you thought possible with just ten fingers. Time to make life pure again, and to purifyou. Plus, with our satisfaction guarantee you have nothing to lose, and only a soon-to-be-favorite bottle to gain. So what are you waiting for? IT'S TIME to purify your lifestyle, and change the way you drink water. Glass is 100% recyclable, and doesn't leach harmful chemicals or unwanted flavors into your water like plastic or metal. 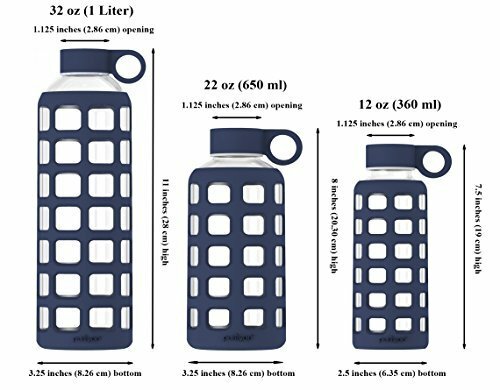 Our water bottle is reusable as many times as you'd like, and is entirely BPA free, Phthalate free, PVC free, lead free, cadmium free and worry free. Try finding that in another bottle. UNIQUE: Our glass is made from high borosilicate glass, which is more heat resistant than any other commonly used glass. Now you can save the planet and enjoy your warm tea too. Still worried the glass might break? Not so fast - our glass is the most durable in consumer retail, and with the added food-grade high-impact-resistant silicone sleeve for drop protection who knows what you'll be capable of (dropping from the 3rd floor of your office building is still not recommended though). MADE WITH CARE: Our lid and glass bottles are optimized for YOU. Our lid features a stainless steel interior cap body so no water touches the plastic. It's also just the right size between a narrow mouth and wide mouth, quick to twist off, and 100% leak-proof. Our silicone sleeve also acts as an insulator, keeping your beverage hot or cold for extended use. Our glass bottles will also brave any weather conditions your home puts them through, because they're both microwave and dishwasher safe. 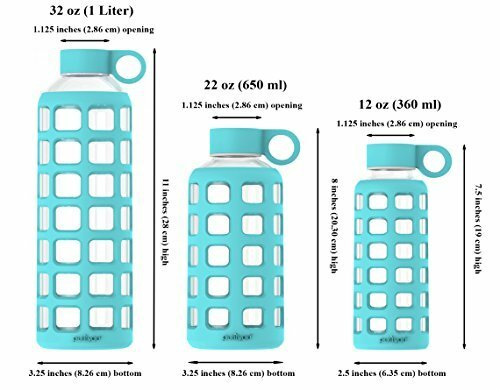 STYLISH AND PORTABLE: Being thinner and lighter than average, you just might find yourself taking your bottle to all sorts of new places. 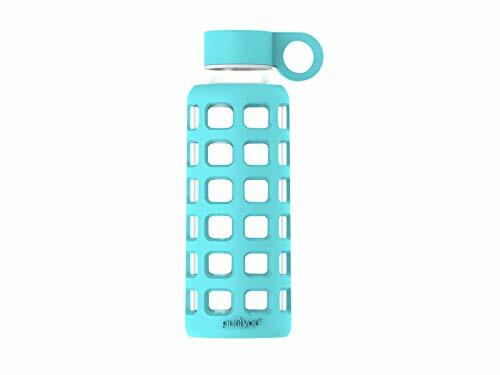 From the yoga mat to those high profile business meetings, our bottle also looks great on camping trips and at the gym. Also a perfect match for essential oils. HELP SAVE THE WORLD TOO, because with every glass water bottle purchased, a portion of our profits is sent directly to building water wells for impoverished communities in Africa. Being a hero for those in need has never been easier. Each bottle sold separately. Sale price available for a limited time.